Come and enjoy with us this great film in Spanish with subtitles, learn new words in Spanish and practice conversation among cool amigos while enjoying some wine and empanadas! Cost: $20 (Only advanced payment will save your spot.) Click here to pay. – 5:00 – 5:30 pm: Greet and meet. Enjoy a glass of wine with an empanada while Jorge gives a brief introduction about about Alfonso Cuarón’s films and why this particular movie is considered one of his best movies after “Roma”. – 5:30 pm: Movie starts. Please try to be on time. – 6:50 pm: Movie ends. – 7:00 pm: Practice conversation with others participants commenting on the movie while enjoying a second round of empanadas and wine. – 7:30 PM: Event officially ends. This smash road comedy from Oscar-winning director Alfonso Cuarón is that rare movie to combine raunchy subject matter and emotional warmth. Gael García Bernal and Diego Luna shot to international stardom as a pair of horny Mexico City teenagers from different classes who, after their girlfriends jet off to Italy for the summer, are bewitched by a gorgeous older Spanish woman (Maribel Verdú) they meet at a wedding. When she agrees to accompany them on a trip to a faraway beach, the three form an increasingly intense and sensual alliance that ultimately strips them both physically and emotionally bare. 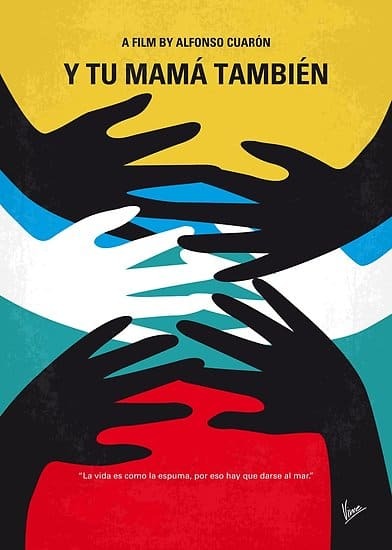 Shot with elegance and dexterity by the great Emmanuel Lubezki, Y tu mamá también is a funny and moving look at human desire. All our movie events are with large screen & sound system.